Suspect water needs worry-free, hassle-free filtration and that’s what you get from this freestanding Katadyn Drip product. No electricity, no pumping, no moving parts, no effort, just set it up, fill the container, and let gravity pull water through the system. You can confidently treat larger quantities – 4 liters/hour into a 10-liter container – making it a must-have for groups, base camps, huts, cabins or recreation areas. The Drip Gravidyn uses silver-impregnated ceramic elements to clean out bacteria and protozoa, as well activated carbon to also reduce chemicals for the extra benefit of better taste and smell.as . No need for pumping or connection to a tap thanks to gravity. The Drip filter is used by international relief organizations as group equipment for preparing water. Also ideal for use in hunting, fishing and mountain huts. 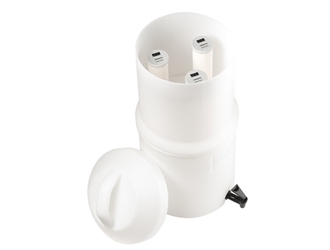 The tried and tested ceramic depth filter removes bacteria, protozoa and other disease-causing agents. 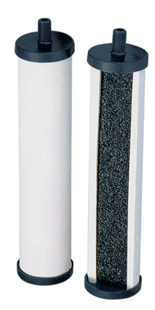 The principle: The micro-organisms cannot pass through the mini pores of the filter ceramic (0.2 microns) because of their size (greater than 0.2 microns = 0.0002 mm). Unlike disposable filters, the ceramic can be cleaned many times - even in the field. Advantage: longer use and lower operating costs.